Description: Aquatic warblers are small and greyish-brown coloured with black streaks and a light brown breast. They have a pale stripe on the crown and a flattened forehead. Male and female aquatic warblers are similar while juveniles don’t have streaks on the breast or flanks. 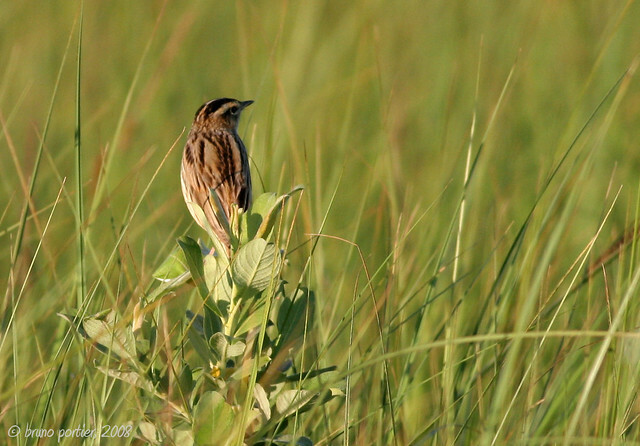 Nesting: Aquatic warblers breed in central and eastern Europe from early May to late July. They build their nests from grass, plant stems, leaves and cobwebs lined with finer materials in dense vegetation over marshy ground or water. Aquatic warblers lay 4-6 eggs which are brown and spotted with yellowish-grey. They incubate for 12-15 days and chicks fledge after 13-14 days. Feeding: Aquatic warblers eat mostly insects, caterpillars and spiders tending to stay hidden on the ground when searching for food. Where to see them: In the UK aquatic warblers are best seen at the end of August. They are found in the coastal reedbeds on the south coast in Devon and Cornwall. Did you know? The aquatic warbler is the only globally threatened passerine bird in mainland Europe.